Wörtlich: Groß, kraft- und gehaltvoll, typ- und ausdrucksvoll, gestreckt, ausgeprägter Widerrist, fester Rücken, richtig gelagerte Kruppe, gute Winkelungen der Vor-, sehr gute Winkelung der Hinterhand, ausgewogene Brustverhältnisse, gerade Front, temperamtentvolles Gangwerk mit guter Schrittweite. Wesen sicher, TSB ausgeprägt; läßt ab. Besondere Vorzüge: Gehaltvolle, typ- und ausdrucksvolle Zuchthündin. Very nice female. I have a male pup from her from the mating to Remo (Bravo). 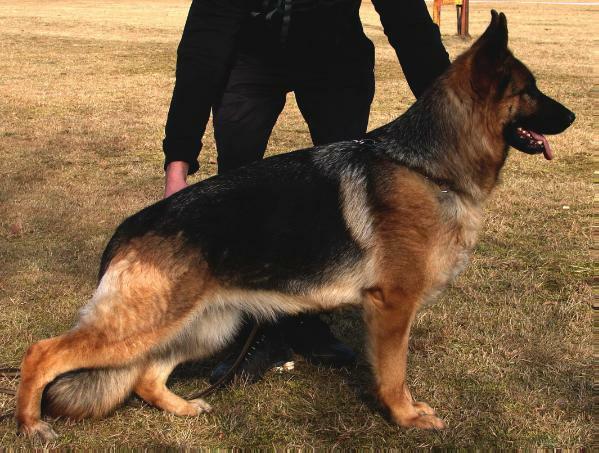 He has a very nice temperament, correct size and structure, and very clear-headed. He has nice movement and is very energetic and animated. I liked the way he carried his head high and looked very alert since he was a young pup. Sometimes I just like to watch him when he gets his exercise on the long line. He wants to have something in his mouth and his latest "toy" is an abandoned skate board that he carries around making "mrooching" sounds. I look forward to doing more with Bravo. I have begun to show him. We will take the coming winter and spring to get serious about continued training. It should be a lot of fun because he is quite the sassy boy who is always surprising me or making me laugh. He is an absolute joy to have. I have heard good things about Winny's pups, including my dog's littermate, who is showing a great deal of success in the conformation ring!